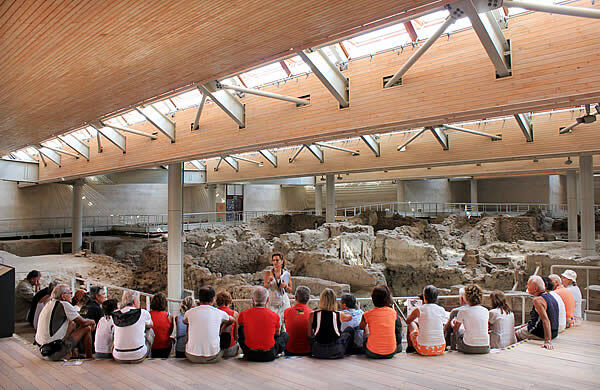 First stop in Fira, where we will discover the prehistorical museum containing many items found during the excavations of the archaeological site of Acrotiri, which is our next stop the so called Pompei of the Aegean sea, considered by some, part of the lost Atlantis. The volcanic ashes that buried the town, preserved ruins from the ravage of time and weather. Afterwards we proceed to Red beach, one of the most beautiful beaches of Santorini, with characteristic red and black color, result of the volcanic activity, where you can relax enjoying the wonderful panorama. 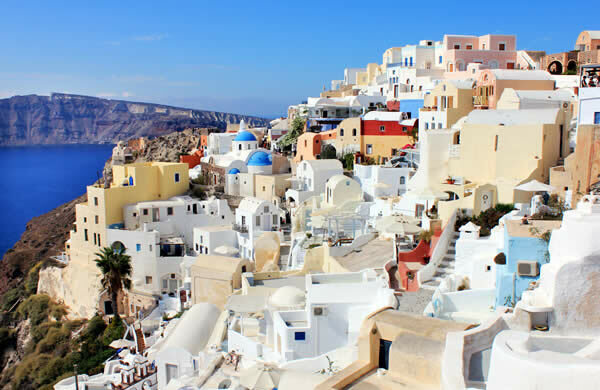 Visit of the town of Fira, where you will discover the hidden parts of this marvelous place of the characteristic Greek architecture. Perched on a cliff of the caldera at 260m over sea level, at every angle are revealed splendid views. You will have free time to seat in a taverna and have a refreshing "frappe" coffee, admiring the stunning countryside or shopping in the numerous souvenir shops and local crafts. 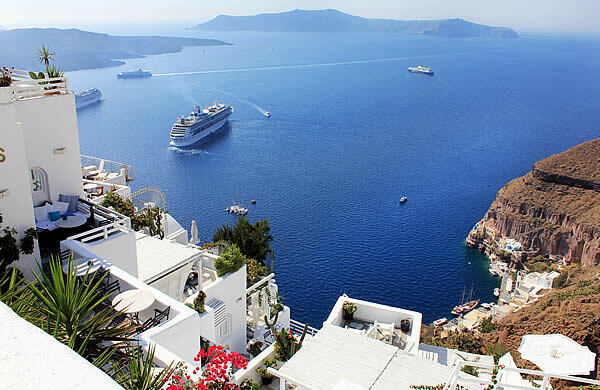 Departure for the typical village of Messaria, situated in the center of Santorini. Surrounded by gardens and vineyards, with white houses and mansions of the late 1800s. We proceed towards Pyrgos also known for its architecture, then Imerovigli with its unique view of the Caldera. At the end we visit Oia, famous for its romantic and breathtaking sunset, inspiration of photographers and painters from all over the world, proud of its naval tradition. Free time for photo shooting and romantic dinner in one of many taverna overlooking the relaxing sea at sunset. We leave from Athinios port to visit the volcano, then the the thermal springs where you can swim in the hot volcanic waters. During the trip our staff will prepare typical Greek snacks with local Santorini wines. 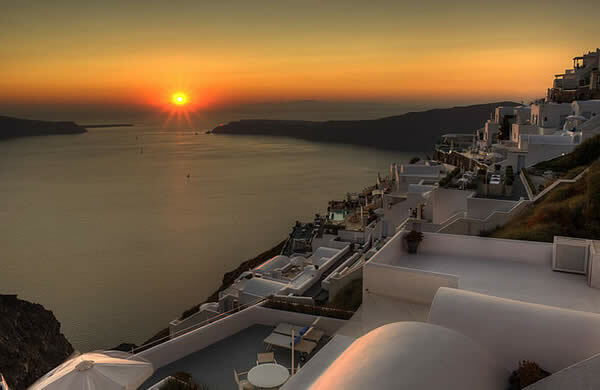 You will enjoy the magnificent view of Oia and the small ports of Armeni and Ammoudi that are at the north of the island.On the way back we will navigate under the warm light of the sunset. Departure and return times depend on the sunset hour. Dinner (meat) and drinks are included. 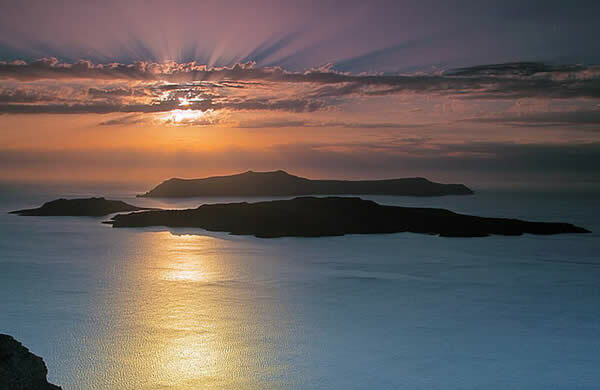 Dedicated to the beauties and forces of nature, the volcano of Santorini.Departure to the port of Athinios where we will embark on the boat that will bring us to the submersed volcano, known as "Kameni". We will arrive on the top of it , where for 90 minutes you can walk through craters and observe in safety smokes and ashes.Then we proceed to Thirassia island, where we can have our lunch in one the small traditional taverna, swim in the clear waters and visit the small village of Manolas on the top of the cliff, either walking or on the back of a donkey.